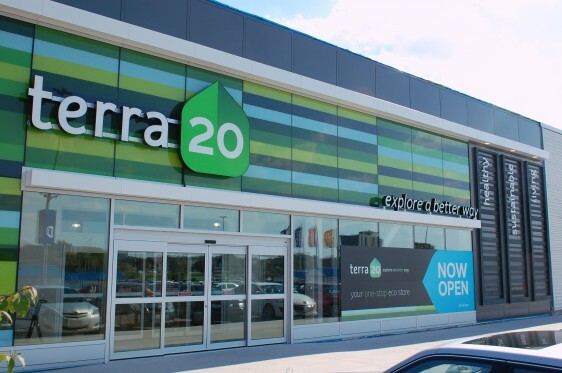 CTV News was among the media outlets present, and profiled terra20 on their Tuesday broadcast with the feature ‘New Eco-friendly shop opens in Ottawa‘. As you can see from the video, the store has been designed to illustrate the company’s mandate of sustainability, using recycled products and environmentally-friendly construction practices wherever possible as well as incorporating plenty of natural light to reduce energy consumption. The terra20 concept has further incorporated numerous unique features to give eco-minded shoppers a more transparent retail experience, reflecting the company’s philosophy of exploring a better way. For instance, icons will indicate a product’s status of sustainability, fair trade, organic materials, water reducing practices, animal byproducts and many others. According to Community Manager Pamela Tourigny, speaking to The Epoch Times, this is meant to cater to people’s varying interests. “Everybody has their priorities and these icons will help people to identify the things that fit within their priorities.” In-store iPads will similarly be employed to inform shoppers on details about the products available and their sustainable practices. The store, as the media preview demonstrated, has further engaged vendors to be a part of the terra20 experience, with plans for on-going in-store education sessions from the vendors themselves. This model of consumer interaction has also been evident in the marketing of the store. terra20 has utilized social media platforms to get people talking, as well as to integrate themselves within the community and generate feedback from customers on the products they find most useful.